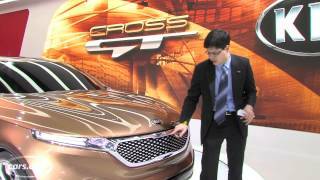 Kia Motors America today unveiled the 2013 Cross GT concept at the 2013 Chicago Auto Show. 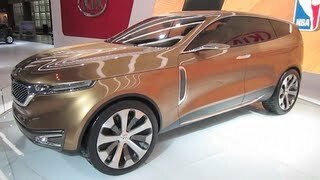 The Cross GT concept is designed to combine the line between Kia’s GT concept and a luxury crossover vehicle. The Cross GT seamlessly melds high technology with nature, creating a harmonious partnership between driver and vehicle that also respects our global environment. The Cross GT is designed to easily accommodate four passengers and their cargo in luxurious surroundings, but the large greenhouse, airy cabin and gently sloping bonnet give the Cross GT a nimble feel that’s at home in crowded urban environments. 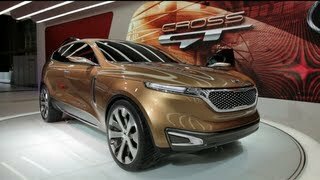 The Cross GT Concpet is powered by state-of-the-art 3.8-litre V6 hybrid, 8-speed automatic and torque-vectoring all-wheel-drive system. This setup enables the model to produce 500 lb/ft (677 Nm) of torque and 400 hp (298 kW), with an all-electric range of 20 miles (32 km) – sufficient to enable exhilarating performance, while delivering superior fuel economy and fuel efficiency.